On Saturday morning, 24 June 2017, a group of enthusiastic lovers of yesteryear gathered for an outing to two of Montagu’s six…or is it nine…(fourteen?) Anglo Boer War Forts. Details on the stone-forts and blockhouses built during the Anglo Boer War are somewhat sketchy today. According to Port Elizabeth historian, Richard Tomlinson, who visited Montagu in 2007 to document what details were available on the Montagu forts, all records on the forts built in South African during this war had been sent to London after the war. Unfortunately, due to lack of space, these records were destroyed after the Second Word War to make room for records of that war. Although that is history for you - the story of the Montagu ABW-forts are far from over, for although a substantial amount of research had been done on it, there are still a degree of ‘gaps in the record’. But this is (always) a good thing, for this is what keeps the subject alive, and of interest to generations to come. To ‘plug’ those holes are an ever-continuing adventure or journey! The members of the Montagu Historical Society were entertained by Alf Boyley, who had prepared a fascinating talk on the forts and the impact of the war on the town of Montagu as whole. Alf also had military badges and medals from the war to show to the audience at the bottom of the koppie leading up to the Nature Garden-fort. The group then eagerly ascended the koppie, to view this magnificat relic of the past from nearby. A spectacular view awaited the visitors, for to see the beautiful town from that angle and height, is truly a remarkable experience. Next stop was the fort behind Cape Dry, up on the Knipe’s Hoogte-koppie. With a trek of all available bakkies and SVU’s, the group landed safely at the picnic-area beneath the fort. From there it was yet another healthy walk with lungs filled with the fresh winter-morning-air up to the fort. What a perfect day it was! Once again, the view of the town and Bloukop, as a perfect backdrop, was truly astonishing! 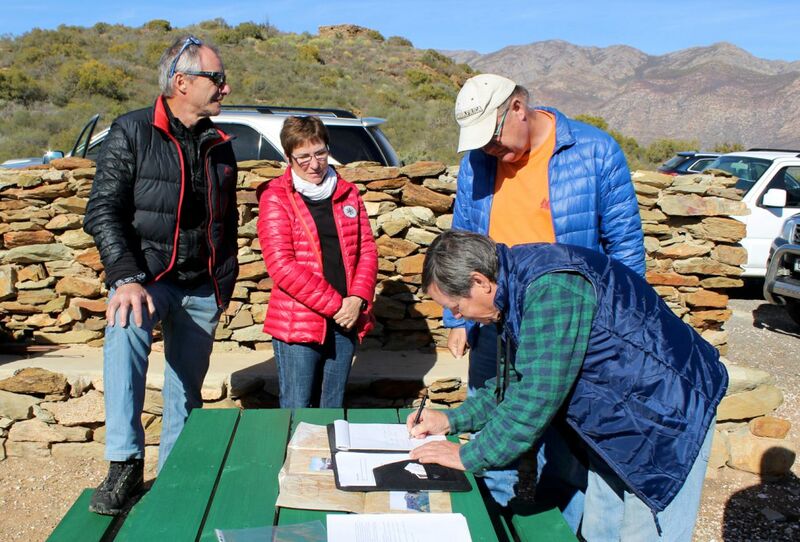 Not only visitors, but also locals stood in total awe… The morning’s programme ended on a perfect note - with cheesecake and coffee at the ever-popular Cape Dry Restaurant. The war-forts outing will be supplemented by a follow-up talk which will focus especially on the presence of Boer-Commandant, Gideon Scheepers to the outskirts of Montagu during the war. It is hoped that the talk would take place at the Ouberg-fort – the best preserved fort of all.